Apple has released iOS 12.1, bringing Group FaceTime and more than 70 new emoji to the iPhone and iPad. 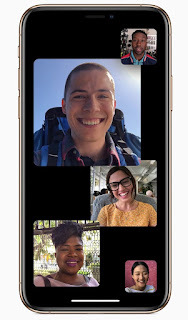 Automatic detection of active speakers: FaceTime uses on-device intelligence to display the most prominent speakers on the call, automatically highlighting the current speaker by bringing them to the forefront. It automatically sizes each person’s image depending upon how active they are in the conversation, based on duration of speech, volume and even motion. Participants who aren’t active will appear at the bottom of the screen until they speak. A simple tap also brings a participant front and center. iOS 12.1 also brings Depth Control in real-time preview and Dual SIM support to iPhone Xs, iPhone Xs Max, and iPhone Xr customers. Apple says that advanced depth segmentation in Portrait mode enables more sophisticated portraits with professional-level bokeh. With iOS 12.1, users can dynamically adjust the depth of field in real-time preview in addition to post-capture, enabling more control to create portraits with a beautiful background blur. Portrait mode with Depth Control is also available on the TrueDepth camera for selfies, which includes Memoji and faster face tracking support for third-party ARKit apps.